The IBM 4245 is a line printer. The Printer Output Unit for the 4245 Models 012 and 020 attaches to the 370 channel interface (byte multiplexer, block multiplexer, or selector channel) for attachment to 4361, 4381, 308X, 3090, S/38 (5381 and 5382) and 9370 processors. Request an RPQ for channel attachment of the 4341. The 4245 Models D12 and D20 attach to the 3174 and 3274 Models 41 and 61 controllers, the 9370 Workstation Controller, and 4361 processor Workstation Adapter and Display/Printer Adapter. The Models T12 and T20 attach via the Twinax interface to AS/400, S/36, S/38, and S/88. Print speed is 1,200 lines per minute (lpm) for Models 012, D12, and T12 with a standard 48-character set printband. Models 020, D20, and T20 are 2,000 lpm with a standard 48-character set printband. The IBM 4245 Model 001 achieves a print speed of 2,000 lpm. The IBM 4245 Model 012 achieves a print speed of 1,200 lpm. This model attaches to the 370 channel interface (byte multiplexer, block multiplexer, or selector channel) for attachment to 4361, 4381, 308X, 3090, S/38 (5381 and 5382) and 9370 processors. The IBM 4245 Model 020 achieves a print speed of 2,000 lpm. This model attaches to the 370 channel interface (byte multiplexer, block multiplexer, or selector channel) for attachment to 4361, 4381, 308X, 3090, S/38 (5381 and 5382) and 9370 processors. The IBM 4245 Model D12 achieves a print speed of 1,200 lpm. This model attaches to the 3174 and 3274 Models 41 and 61 controllers, the 9370 Workstation Controller, and 4361 processor Workstation Adapter and Display/Printer Adapter. The IBM 4245 Model D20 achieves a print speed of 2,000 lpm. This model attaches to the 3174 and 3274 Models 41 and 61 controllers, the 9370 Workstation Controller, and 4361 processor Workstation Adapter and Display/Printer Adapter. The IBM 4245 Model T12 achieves a print speed of 1,200 lpm. This model attaches via the Twinax interface to AS/400, S/36, S/38, and S/88. The IBM 4245 Model T20 achieves a print speed of 2,000 lpm. This model attaches via the Twinax interface to AS/400, S/36, S/38, and S/88. * There is one set of OCR bands for use on any of the models. This set provides for higher OCR speed of 2,000 lpm. There is also an additional set of OCR bands specially designed for the Models 20, D20, and T20, providing better OCR print quality at 1,906 lpm. Print speed depends on frequency of use of various characters. Most 4245 print bands have been optimized to add greater frequency of commonly used characters. This enables most print jobs to run faster than if the frequency of all characters was equal. 132 print positions is standard. Horizontal spacing is 10 characters per inch. Vertical spacing is 6 or 8 lines per inch under program control (except System/36 Release 4 which is manual only). The carriage is a dual-speed unit with normal skipping up to 0.61m (24 in.) per second and high-speed skipping up to 1.4m (55 in.) per second after six lines have passed. The output forms stacker is power-assisted. Continuous marginally punched forms are fed by a pair of forms tractors. Maximum forms dimensions are: Width - 559mm (22 in. ); length - 610mm (24 in.). Minimum forms dimensions are: Width - 89mm (3.5 in. ); length 76mm (3.0 in.). Note: In the stacker, the minimum fold-to-fold length is 152mm (6.0 in.). Other devices attached to the 3174 or 3274 Control Unit, 4701 or 4702 Finance Communication Controller, or 4361 Processor Workstation Adapter or Display/Printer Adapter. To determine whether the 4245 printer can achieve the desired throughput for a given situation, an initial estimate of anticipated throughput should be made on the basis of the speed of the desired printer model (Mdl D12 or D20) using the selected character set size (48, 64, etc. ), and considerations of the output format for the document to be printed (as defined by average number of characters per line and lines skipped. The output format translates into the character rate that is required when running at the desired speed. This character rate requirement will give a rough idea of the possible effects on printer throughput of other transactions processed by the 4361 Processor Workstation Adapter and, conversely, will help assess the significance of 4245 printer operations on the performance of other transactions processed by the 4361 Processor Workstation Adapter. The character rate is especially important for remote 3174, 3274 or 4701 subsystems. Comparison of this character rate with available TP-link capacity (e.g., a maximum of 1,200 characters can be transmitted per second on a 100 percent utilized 9600 bps line) will show whether it is feasible to run the selected printer at its desired speed. 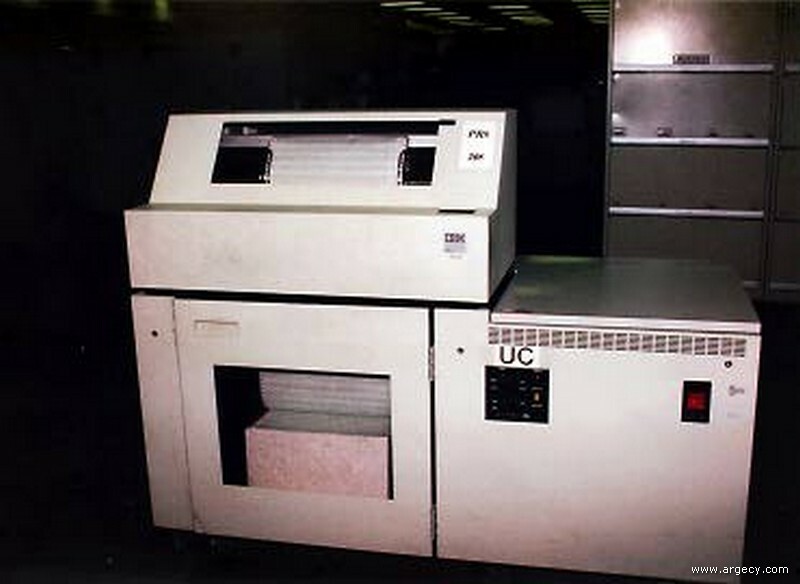 For the 3174 or 3274 control unit, the effect of output format on 4245 printer throughput, and the effect of printer operation on the performance of other devices attached to the 3174 or 3274, will be discussed in a manual available to IBM systems engineers for use in assisting IBM customers with this analysis: "Performance Guidelines for the IBM 3274 Display Control Unit" (ZZ20-4167). In addition to the performance considerations listed above, the 4245 models D12 and D20 are sensitive to data stream characteristics. Optimum throughput can be achieved using SNA LU-1 Data Streams. Significantly less than maximum rated speeds may be experienced when using BSC or DSC (SNA LU-3) Data Streams. Refer to the "Information Manual (Operator's Guide)," GA33-1586, for additional details. In the VM/RSCS environment, RU=1,024, Pacing=2, VPacing=4 is a good starting point. RSCS Version 2 is recommended. It is best to use a dedicated RSCS Virtual Machine for the 4245 printer(s). In the MVS/JES328X environment, RU=1,280, Pacing=1, VPacing=5 is a good starting point. JES328X Version 2 is recommended. If PTF UB00879 is installed on JES328X Version 2, define the 4245 D model as a 4245 to JES328X and data compression will take place. If Version 1 is used or Version 2 without the PTF, define the 4245 D model as a 3262. Set the JES checkpoint page value to the 20-30 range. This has a performance versus error recovery trade-off the customer will have to make. If running in DSC mode, it is recommended that the Early Print Complete be activated in the printer for performance considerations. Again, this has performance versus error recovery implications that the customer will have to address. If running in DSE mode, it is recommended that LU1/SCS mode be used instead. It is highly recommended for remote installations, in either software environment, to use a dedicated line and dedicated 3174/3274. A minimum of 19.2KB line is recommended for a D12 and 56KB for a D20. All of the above replacement items except vacuum bags can be purchased for IBM-maintained machines. See the "Supplies" section for further information. Upgrades may be made in the field from a Model 12 to a Model 20, from a Model D12 to a Model D20, or from a Model T12 to a Model T20. 4245 D12/D20 without specify feature #9160 may be changed in the field to a D12/D20 with specify feature #9160 and vice versa. Conversions cannot be made from a Model 12 to a Model D12 or a Model 20 to a Model D20. All conversions require MES orders. Only marginally punched, pinfeed, continuous forms may be used. For multiple part forms it is recommended that both sides be securely fastened. However, when only one side is fastened it must be the right side. For full flexibility of column locations for margins, 451mm (17.8 in.) maximum width forms are recommended. If forms greater than 356mm (14 in.) in length are used, the rear stacker enclosure must be opened. If forms greater than 432mm (17 in.) in length are used, the front forms compartment door must be left open. For additional information, see "Forms Design Reference Guide for Printers," GA24-3488. No staples are permitted in the area exposed to the print band. Both edges of the form must be engaged by the pinfeed forms tractors. All 4245 models except model 1 may be used to generate input in OCR applications (see "Supplies" section for ribbon recommendations). Multiple-part forms are not recommended for OCR printing. The print quality of the top sheet is affected by the underlying sheets. Under no circumstances should the copy sheets be used for optical scanning. For best results use 75-90 g/sq.m (20-24 lb.) OCR bond in single-part form for printing. OCR form utilizing other papers should be tested for satisfactory results with user requirements. When reading 4245 documents on the 3886, reread on reject capability and 3211/5211 compatibility (#9701) should be used on the 3886. For OCR-B, in addition to OCR numerics, only four specials (less than, greater than, plus and diagonal), and the 10 letters used by the ECMA (European Computer Manufacturing Association) and NRMA (National Retail Merchants Association) have been qualified in readability performance. These 10 letters are: A, C, E, N, P, R, S, T, V, X. Print quality and printer operation (such as forms feeding and stacking) varies with paper specifications, number of copies, ribbons, and environmental conditions (temperature and humidity). Forms of more than four parts or forms with a first part heavier than 49 grams/sq. meter (13 pounds) should be tested under operating conditions to verify that results are satisfactory for the user applications. The maximum forms thickness is 0.51mm (0.020 inches). One operator changeable print band for each 4245 printer (see "Specify" section). One control unit position on a system byte multiplexer, selector, or block multiplexer channel for each model 1, 12, 20 printer. A maximum of two 4245 Models 12 or 20 (or 3203 Model 5) can be attached to a System/38. See M5381 "Special Features" for attachment explanation. Models D12 and D20 attach via 3174, 3274, 4700 communication controllers, 4361 WSA or DPA as terminal or system printers, or System/38. Attachment as a 4361 system printer requires specify feature #9160 on the printer. See M4361 pages for additional prerequisites. Attachment of Models T12 and T20 to System/36 requires software Release 4 or later. Attachment of Models T12 and T20 to System/38 requires Release 7 or later release. The 4245 Models 12 and 20 can be run in native or compatibility mode. The mode of operation must be reflected in the operating system's I/O table. This may require an I/O generation. There are two compatibility modes: 1) 3211 for MVS and MVS/XA, and 2) 3262 Model 1 for VM and DOS/VSE. MVS, VM, and DOS/VSE require that the image library contain Form Control Buffers (FCBs) for various print applications. For MVS, a new image library member must be created. When migrating applications from printers that use carriage control tapes, an FCB must be created that is equivalent to the carriage control tape. Otherwise, existing FCBs may be used. Note: JES2 requires a channel 1 in the first position of the FCB. Customers should contact the IBM Support Center for all applicable PTF information. Related software product areas such as DFP and MVS/JES should be searched for PTFs as well. Unless indicated otherwise, these specify features are only available at time of manufacture. If 4.3m (14 ft) cable is not desired, specify #9986 for 1.8m (6 ft) cable. A watertight Russel and Stoll #3760 plug is provided on the cable. The plug is the same as used for 3203 Model S, 3211/3811, 1403 Model N1/2821 Model 1, 2, and 4248. Color: Machine is available in Pearl White only. Specify feature #9160 on Model D12 or D20 for attachment to 4361 Processor Workstation Adapter. See M4361 for prerequisites. Print Band Character Set: Select one band only by specifying one number from Groups A, B, and C. Please note some cases where selections from Group B or C are not required. When printing eight lines per inch, 2.0mm (0.079 in.) character height is recommended. One print band will be shipped at no charge with the printer. Replacement or additional print bands may be obtained by the customer for a charge. See "Supplies" section. Special (RPQ) print bands may be required. Please review printing requirements prior to placing the order. Available only with the 2.4mm (0.095 in.) character height. No selection from Group C is required. A selection from Group B is not required. Do NOT specify character height with this character set. It automatically comes with character height #9950. Available only with language selection (See Group B) #2956, #2961. Available only with language selection (see Group B) #2956. If using multiple bands of different languages for this character set, the customer must ensure the correct band (language) is installed on the printer, since the print band verification done by the printer will not distinguish among different languages for this character set. See "Customer Responsibilities" under "Highlights." P/N 7034437 or equivalent is required for all non-OCR printing applications. P/N 6204923, or equivalent is required for OCR printing applications. P/N 6092766, or equivalent is required.